A few years ago I had the pleasure of baking in the kitchen of my good friend, Judith McLaughlin. 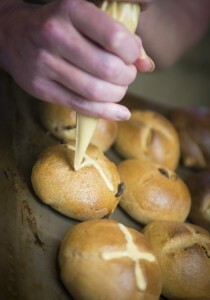 We were joining forces to try our hands at making traditional hot cross buns from freshly milled flour. As a native of Ireland, hot cross buns are a part of Judith’s holiday celebration. Our results were so delicious I thought we would share this post again. Don’t let the superstitions and legends surrounding these delicious rolls deter you from trying them. You will want to bake these slightly sweet fruit studded little rolls all year long not just for holidays. Enjoy! 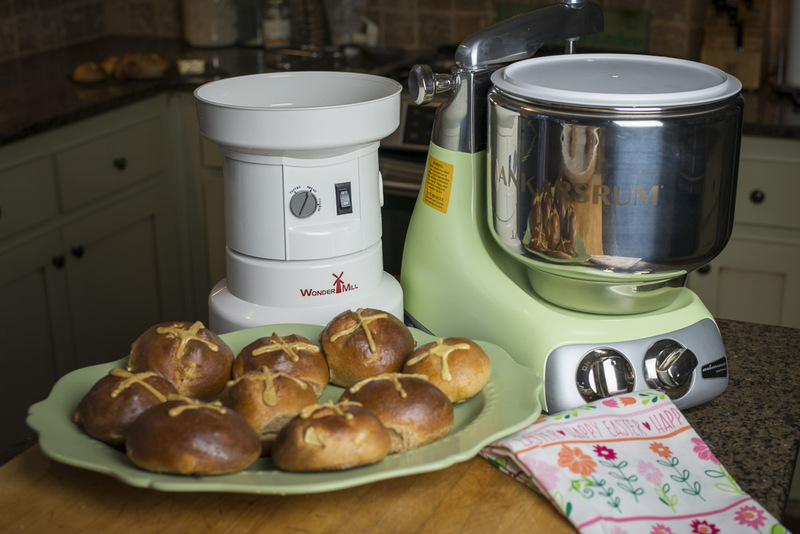 Having grown up in Northern Ireland where Hot Cross Buns were an Easter tradition, Judith wanted help to make a healthier version using only freshly mille d whole grains. With a Wonder Mill in hand and Judith’s new pearl green Ankarsrum Assistent Original, Sue came to her aid. The two kindred spirits had great fun in the kitchen coming up with two healthy variations of the traditional Hot Cross Buns. Sue enjoys the flavor of spelt, so used it for the Apple Cinnamon version and used the hard white wheat for the Orange Cranberry recipe. This is a yeast dough so any hard wheat combination of grains could certainly be used. There are varying legends surrounding the origination of the hot cross bun. Some claim pagan roots while others say it is strictly Christian. What ever the origin, these little buns are absolutely delicious. If so inclined, you can skip cutting in the cross and omit the icing. 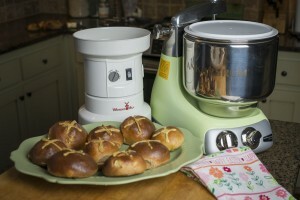 The eggs, milk and butter used in Hot Cross Buns make a light and airy bun with a soft texture. Though traditionally eaten on Good Friday, you will want to enjoy these delicious Hot Cross Buns all year long. Combine the water, milk, and butter in a medium saucepan over low heat until slightly warm and butter is melted. Remove from heat and pour into a large mixing bowl. Add the honey granules, egg and vanilla and stir to combine. In a separate bowl, whisk together the flour, salt, nutmeg, and cinnamon. Stir in half the flour mixture to the warm liquids, then sprinkle the yeast in while continuing to mix. Add the rest of the flour as needed to form a slightly sticky dough. Stir in the orange zest and dried cranberries. Knead until smooth and elastic, about 5 minutes, adding a little more flour if necessary. Shape into a smooth ball. Put dough in lightly buttered bowl, turning to coat. In the Ankarsrum, the dough can rise right in the mixing bowl by simply covering the bowl with white lid once the kneading is completed. Cover and let rise at room temperature until doubled in size, about 1 hour. Dough can be made the night before and allowed to rise in the refrigerator overnight. To form the rolls: Grease a cookie sheet. Turn the dough out of the bowl and using a bench scrapper divide into 12 equal portions, about 2 ounces each. Tuck the edges of the dough under to make round rolls and place them seam-side down in the prepared pan, leaving a little space in between each roll. With a sharp knife cut a cross in the top of each roll. Set aside in a warm place until the rolls rise doubled in size, about 25-30 minutes. Once risen, brush the tops of the buns with the slightly beaten egg white. Bake rolls until golden brown and puffy, and an instant read thermometer inserted into the center of the rolls registers 190 degrees F, about 20 minutes. For the glaze: Whisk together the powdered honey granules, orange juice, orange zest and vanilla until smooth. When making icing with honey granules instead of powdered sugar, it is best to make the icing, then allow it to sit for a few minutes to dissolve the honey granules. Whisk again just before using to make a smoother icing. Transfer icing to a zip bag or pastry bag, and make a small cut in the corner of the bag. Ice buns in a thick cross shape over the top of the cooled buns using the slice markings as a guide. To the above recipe: Substitute 1 finely chopped apple for the cranberries (or add them in addition to the cranberries for an even more delectible variation) and use zest of lemon for orange zest if desired. For the Caramel Icing: In a small saucepan, over low heat, melt ¼ cup butter. Add ½ cup sucanat or molasses granules and stir constantly over medium heat for 2 minutes. Whisk in 1/8 cup of milk. Remove from heat and cool slightly. Transfer to a mixing bowl and whisk in about 1 cup powdered honey granules until smooth and spreadable consistency. If too thick add a dash more milk. Whisk vigorously to make a smooth icing. Pipe onto buns in a cross shape. Previous Previous post: Rye – Superfood!